The Romeo y Julieta Short Churchill is a delicious and accessible medium Habano, of robusto format, with 50 ring gauge, 4.9” (124mm) long and comes in a box of 10 cigars. This vitola develops typical Cuban aromas, rich wood, earth, leather and some hints of fruits and chocolate. It is a cigar that can both appeal to aficionados of mellow cigars and to novice smokers. Released in 2006. The Romeo y Julieta Short Churchill is a wonderful vitola, that is never too powerful. •	The Short Churchill keeps only the very best of his big brother, skipping the uneasy first puffs. •	This shorter format allows modern cigar smokers to enjoy a true Cuban stogie when time is of the essence. This cigar is creamy and complex with ample draw and good construction. The Colorado shade wrapper is a little toothy to the touch, light brown in color and the veins are a little visible. The cigar is tightly rolled and well packed, it is pretty firm from the head to the foot when squeezed. Well made triple cap. 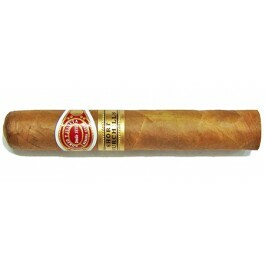 The cigar sports a second and elegant golden band that reads “Short Churchills”. Unlit, the wrapper smells like wood with a nice tobacco flavor. The cold draw is typical Cuban tobacco and some wood and spices notes. The construction on the Short Churchill is top-notch, as the draw on this cigar is great and effortless throughout. The burn line is slightly wavy at the beginning, but it is correcting itself further on, it doesn’t require any attention. At the foot, about an inch of a dark grey ash holds on firmly. Generous billows of smoke are generated at each draw; the smoke has an earthy aftertaste. Woody flavors greet you upon lighting the cigar, leaving some saltiness on the lips and on the finish. The dominant flavors in the first third are of wood and earthiness, while some pepper notes, not too spicy, are also present. The smoke is creamy and thick. In the second third, the saltiness from the first third is gone and now there is ample space for some tasty tobacco, leather and still some spiciness from pepper. Some darker notes are also appearing around the halfway point, we get some mineral, some earth hints and some strong espresso notes. The undertone of espresso lingered until the final third. The body of the cigar is now in the medium range, while the finish is a bit stronger. The smoke is now whiter and less creamy. In summary, a splendid, medium- to full-bodied cigar that is well made with a good burn and smooth draw producing lots of smoke loaded with classic Romeo y Julieta flavors. Should be even better as the years roll by.